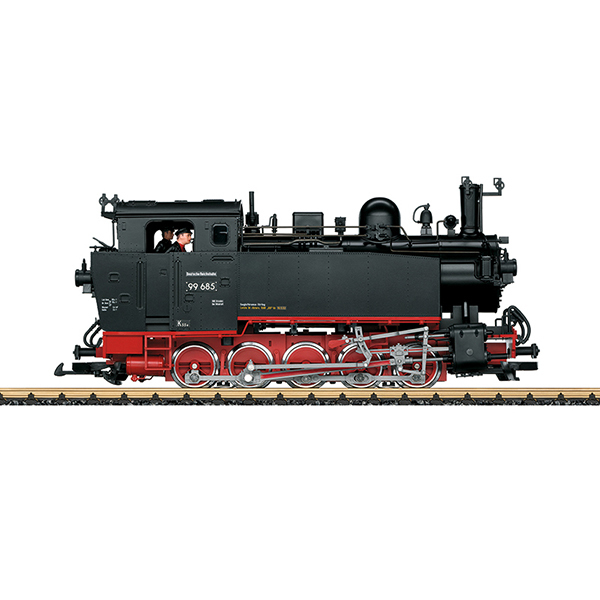 Model: This is a model of a DR class 99.6 narrow gauge steam locomotive (former Saxon VIk). The paint and lettering are prototypical for Era III. 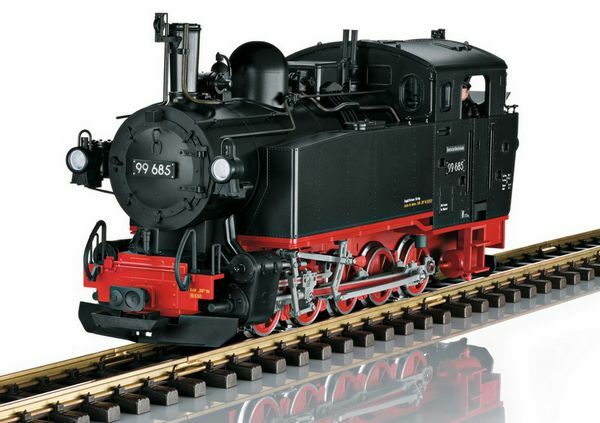 The locomotive has traction tires and is driven by two powerful ball bearing Bühler motors. 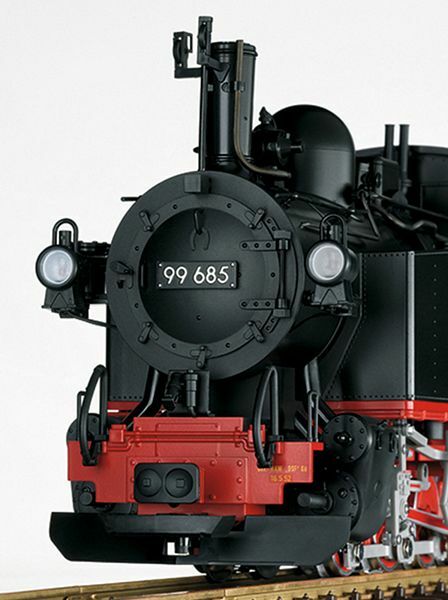 It has an mfx/DCC decoder with many light and sound functions such as headlights that change over with the direction of travel, firebox lighting, cab lighting, operating sounds, whistle, and much more. The built-in smoke generator with steam exhaust is synchronized with the wheels and there is cylinder steam. 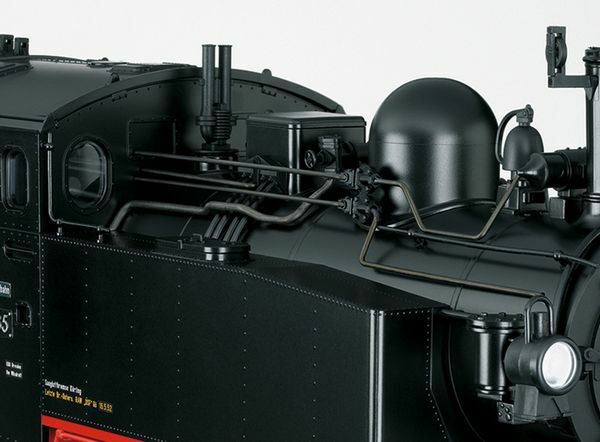 There are many separately applied details, and the cab and smokebox doors can be opened. Length over the buffers 41 cm / 16-1/8". The DR Steam Locomotive, Road No. 99 685 From the trove of military field railways in World War I in 1919, the Saxon State Railroad took over 15 superheated steam tank locomotives as the class VI K for its narrow gauge 750 mm / 30 inch lines. These units had five coupled axles and were delivered shortly before the end of the war. They were then rostered on the DRG as road numbers 99 641-655. Since they turned in excellent results, the DRG ordered 47 more units that were delivered between 1923 and 1927 as road numbers 99 671-717. Among them was road number 99 685 that came from the Saxon Machinery Works, Inc. on November 6, 1925 to the Thum Narrow Gauge Network. On December 30, 1935, this locomotive changed to the Wilsdruff District on the Wilsdruff Network. After World War II, there was a short interval between 1945 and 1954 in Zittau. Then it went back to Wilsdruff. At the end of 1963 / beginning of 1964, its working life was extended at the maintenance facility in Görlitz by the installation of a new boiler as well as new water tanks and a coal-bunker. It was last used on March 13, 1971 (designated as road number 99 1685-9 from mid-1970 on).